I did it. I finally made them. 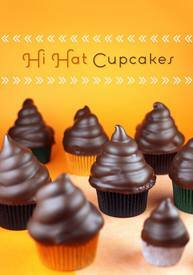 Hi Hat Cupcakes have consumed my cupcake thoughts since I first saw their tall chocolate dipped tops online after I started blogging. But, I have to tell you, I’ve been nervous to make them. They scare me. I knew for sure I would screw them up and end up with a melted mess. But they came out AWESOME! !